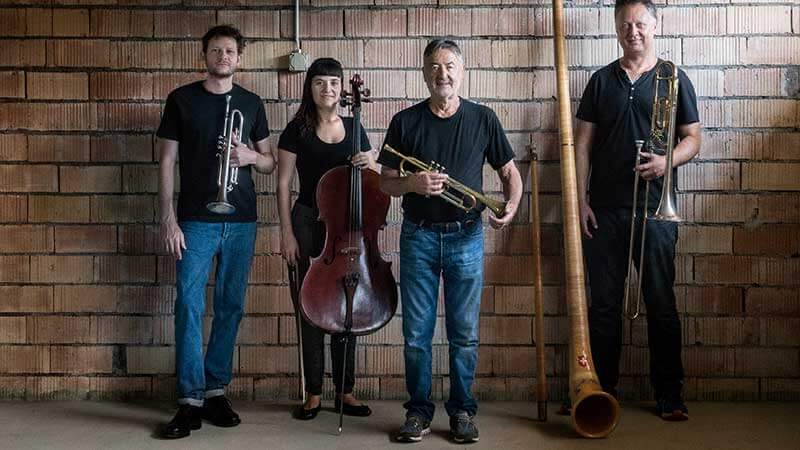 With groups such as Alpine Jazz Experience and Mytha, jazz trumpeter Hans Kennel sounded out his personal relationship with folk music 30 years ago and expanded it as a pioneer – long before «neo-folk music» even existed. This «alpine echo» also shines through in his new band. Wood & Brass works with untempered moods and bittersweet harmonies of the natural tones. At the same time, Kennel turns the focus of his band back to jazz. Back in the 60s, he was a famous hardbop trumpeter who went along to do jazz rock (Jazz Rock Experience) and fusion-jazz (Magog). With Wood & Brass, the 78-year old trumpeter has now founded a chamber music jazz quartet which spans three generations. The youngest voices belong to Zürich trumpeter Silvan Schmid – who can be heard at the festival with a quintet of his own – as well as Cégiu, a musician hailing from Zug. She is also at home with Avant-pop and lends the music of Wood & Brass an extra captivating touch with her cello and voice.